Sitting with a friend in Cruise’s in Ennis the other Monday night I tried to describe the participants in the previous evening’s entertainment. “The accordionist had a moustache and was challenged in the follicle department, “ I told my Clare-born friend. He suggested Conor Keane, but I’d never seen Conor with an upper lip growth. “The flute-player had grey hair and was about our age,” I mooted, “and he kept playing a few runs and stopping.” My accomplice was none the wiser. “The fiddler was well over six feet tall, very slim and had the sweetest tone I’ve heard in a long time,” My compadre racked his brains unsuccessfully. Unbeknownst to either of us, back in the bedroom of my B&B was the photographic evidence which would have solved the conundrum posed by my feeble descriptions (well, at least it would have answered two of the questions), for, as I later discovered, on my return to London, one simple riffle through the contents of the liner for Waifs and Strays would have identified the fiddler and flute-player in question as, respectively, Denis Liddy and Michael Hynes, though I’d still have been none the wiser regarding the physiognomy of their accompanist, guitarist Rob Sharer, and the identity of mysterious moustachioed accordionist remains unsolved. Such personal identity parades would have been more readily solved had I followed my initial inclination and attended the London launch of Waifs and Strays some months earlier, rather than bowing to a friend’s desire to see a film so memorable that I’ve already forgotten its title. Had I done so I would already have obtained a copy of this stupendous recording and spent part of my time in Clare attempting to track down Messrs Liddy and Hynes. For, alongside the releases of The Tap Room Trio and O’Brien & Ó Raghallaigh’s Kitty Lie Over, this is one of the absolutely essential, unequivocally gorgeous releases of 2003 and, as in the case of the other two albums, will be regarded as a benchmark recording for many years to come. The format of the album is tantalisingly simple and consists of Liddy’s fiddle and Hynes’s flute intertwining over fifteen delicious slices of music, sometimes playing solo, usually to the accompaniment of Sharer’s guitar (often well to the back of the mix) and occasional double bass. Reels predominate, constituting seven of those fifteen tracks, but there is also space for hornpipes, single and double jigs, a set of Sliabh Luachra polkas, a set of old-fashioned waltzes, a tune from James Scott Skinner via Seán McGuire, while a live recording of the Caledonian Set complete with the sound of dancing feet completes the album. There’s a sweet delicacy to much of their music, but it is never cloying to the ear while some of the tune changes are both unexpected and adroitly handled. All told, Waifs and Strays doesn’t just bring a breath of Clare, but a mighty inhalation of fresh air. The liner notes contain quite detailed biographies of Denis and Michael (plus a shorter one of Rob) and informative notes on the tunes and their sources. This is an original review by Geoff Wallis. 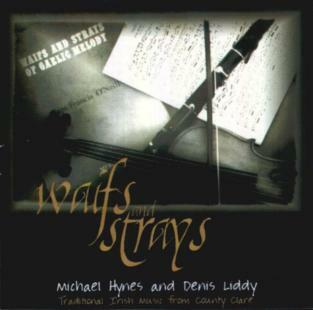 To learn more about Waifs and Strays visit www.liddy-hynes.com/.